Special bonus book review in preparation for Virtual Book Club (#vbcbooks), being held tonight on Twitter. The author will be joining in our chat today! Come join the VBC every second Monday of the month at 9pm EST! Going to a new school or two and trying to make new friends is hard enough. But when your severely deaf and need to have a bulky hearing aid strapped to your chest? That makes it even harder! And so Cece Bell recounts her adventures, from losing her hearing at a young age to having the powerful Phonic Ear strapped to her body, wondering if anyone will accept her for who she is, not for her disability. 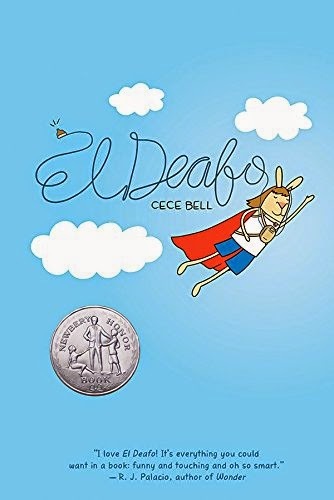 El Deafo is an amazing memoir, but written in such a simple and approachable way. The graphic novel format is perfect for the story, because the loss of hearing (empty speech bubbles) is more poignant. The fact that everyone is illustrated as a rabbit further puts emphasis on the ears. The text is simple and straightforward, which makes the story all the more striking. But still, it tells a gripping story. I will sum up my review this way: I wish I had read this beautiful book sooner. I had not initially read it in preparation for the Newbery awards because of the graphic novel format, not knowing if the committee would consider it. Well now I know! I'm so glad it won the Newbery. I definitely recommend it.